As a little pre-Revue treat to build up enthusiasm for Make Tasmania Great Again (the 2017 Uni Revue!) we’ve released this fun little number! This was a number in the 2014 Uni Revue, and we’ve resurfaced it in magnificent 4K for the thrill of it. If you want to see more like it – you know what show you need to see. 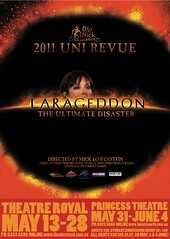 If you’re still unsure, I’m talking about the UNI REVUE of course! Book tickets now and come and see Uni Revue! Don’t forget to like the Uni Revue on Facebook to see more stuff like this in the future!